My stash of freezer foods for my daughter, Ivy, is one of my greatest sources of pride. Forget a big bank account—if I have a freezer full of Banana Carrot Oat Muffins, Acorn Squash Pancakes, Cauliflower Tater Tots, and Broccoli Tater Tots, I am truly a rich woman. My daughter eats like me—she’s definitely a "Meat On The Side" kiddo. And she wears her bib proudly. She eats every veggie under the sun (even if she doesn’t always know it! ), which is incredible! But I do want to get a little meat into her diet. And since I know meatballs freeze really well, I went to work perfecting one for the whole family. And even though the goal is to add meat here, let's be real—I knew right away I wanted to bring veggies to the party. I also wanted to make a meatball that was a little on the moist side, so it would be perfect for new eaters who don't have all their teeth yet. Pureed roasted eggplant and zucchini add moisture and a depth of flavor that don't just make these meatballs more nutritious—they elevate them to a ridiculously flavorful level. You're using vegetable puree instead of milk or any other wet element you might normally add to your favorite meatballs. And you end up with an awesome meatball. Or maybe we should call it a vegemeatball. Or maybe not 😉 . Preheat the oven to 400°F. Cut the eggplant in half lengthwise and place the halves cut-side-up on a rimmed baking sheet. Drizzle them lightly with ½ teaspoon of the oil and then sprinkle ¼ teaspoon of the salt and ¼ teaspoon of the pepper over them. Bake the eggplants until they are very soft—about 15 minutes. While the eggplant is baking, cut the zucchinis in half lengthwise and drizzle them lightly with the remaining ½ teaspoon of oil and then sprinkle them with ¼ teaspoon of the salt and ¼ teaspoon of the pepper. Remove the eggplant from the oven and add the zucchini cut-side-up to the same baking sheet. Continue to cook the eggplant and zucchini until the zucchini can be easily pierced with a fork and the eggplant is very soft—25 to 30 minutes more. Then remove the baking sheet from the oven, but leave the oven on. When the vegetables are cool enough to handle, use a spoon to scrape the flesh of the eggplant into a food processor or blender; discard the skin. Then place the entire zucchini (including the skin) into the food processor as well. Process until pureed; this should give you about 1¾ cups of puree. Transfer the puree to a large bowl, then add the beef, breadcrumbs, parmesan, egg, rosemary, onion powder, garlic powder, and the remaining ½ teaspoon of salt. Mix to combine well and then form the mixture into tablespoon-sized balls by hand and space them evenly on a prepared baking sheet. Bake the meatballs until they are golden brown—about 30 minutes. If you wish, you can sauté the meatballs instead of baking them (if your meatballs are on the moist side, this may be a little harder to do). 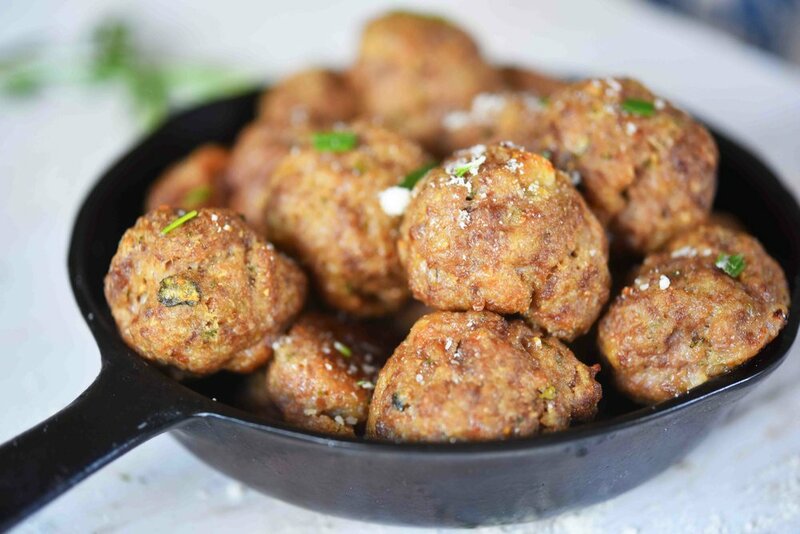 After forming the mixture into balls, heat 1 tablespoon of olive oil in a large pan over medium heat and cook the meatballs, turning occasionally, until they are golden brown on all sides—8 to 10 minutes. To reheat the meatballs, bake them in an oven preheated to 400°F for 10 to 12 minutes.